Parental Care Ministries - New Blog - Click Here! Parental Care Ministries, the umbrella body which operates the Henderson School and other projects in Uganda has begun a redevelopment and rebranding phase within the whole ministry. As a result of this initiative the 'Henderson School' will now be known as 'Parental Care School'. The name change will allow the whole ministry to develop and grow. The recent visit of pastor Emmy Nnyanzi, the director of Parental Care Ministries, and the meetings held between PCM and Mission International finalised some of the main issues as well as considered new plans for the future of this vital ministry. Back to Mission International blog page. Henderson School's Founder - UK Visit! Pastor Emmanuel Nnyanzi and his daughter Grace are planning to make a trip to the UK in November 2008. It is planned that the pair will travel throughout England, Wales and Scotland to visit friends and to raise the profile of Parental Care Ministries the umbrella organisation which operates the Henderson School. Pastor Nnyanzi and his wife Sarah have established Parental Care Ministries in Mbarara, Uganda part of which is the Henderson School Complex. To date the development of Henderson School has been slow and deliberate. The pressures of need versus resources will always be a problem where families are large and poverty cripples the economy. The school presses on, the new regulations dictated by the government as a result of a number of school fires has added extra pressures but their 'never say die' attitude is a lesson to us all. The school is doing such a wonderful job providing a quality education for the many, many children who otherwise would be relegated to a life of illiteracy and poverty. We congratulate Pastor Emmy Nnyanzi and his wife Sarah for their grit and determination in the face of a task which would have left lesser mortals squirming in the dust. Lack of cash limits building work! A school in Buddo Uganda lost a large number of children due to a fire in one of their dormitories. This horrific situation was made worse since the children were locked in over night and could not escape the flames. This tragedy has resulted in the Ugandan government clamping down on schools in an attempt to prevent such a recurrence in the future. However, poor schools have fallen foul of the new regulations making it very difficult to comply and putting the education of many pupils at risk. Henderson School is involved in an extensive building programme which may be delayed or halted as a result of these regulations. Building work is underway but now due to a lack of cash to continue the school has had to delay further work and now they are caught between a rock and a hard place unable to finish but requiring to comply with the new regulations. These pictures show the work on extending and refurbishing the school well underway. We now require a further injection of cash to complete the current schedule of work. The underground phase of a pit latrine is almost complete (above) the concrete slab and the structure on top remain to be finished. Some of the roof work here (above) is almost finished. Where do you begin when you have nothing? One thing I learned early on as I visited Africa, in particular Uganda in the early years was that getting started is a most important stage in any long term project. The most interesting difference between a Westerner's idea of a project and that of an African is that in the case of the Westerner, we usually like to have all of the funding in place, the plans drawn up and the personnel recruited before the process of building our dream takes place, so that it can all be done in 'a one-r'. However in the case of an African who starts on a project, although the plans may look the same and the end result may be anticipated, the process of completion is somewhat different. Poverty forces a project manager to build what he can when he can so that the funds realised cannot be used for something else just as pressing thus losing the potential of a start being achieved. The number of buildings that I have seen where the foundations have been laid and the first few brick courses have emerged before a long wait, often into many years, has taken place before the next traunch of funding has materialised is quite incredible. Then after a long time a further burst of building has taken place and in fits and starts the dream is realised. The dream makers, Pastor Emmanuel Nnyanzi and his wife Sarah, standing amidst the buildings, permanent, temporary and incomplete as the vision of a quality education for the children of this very poor area is progressed towards its ultimate goal. Henderson school began some years ago as a result of a 'windfall' when we changed our mortgage provider. The offer of £1000 in the hand and a lower interest rate was too much to fore go and we grabbed the then unrivaled opportunity. Of course we were to pay for it later when the short term lower rate was raised in line with other lenders. Never-the-less, this 'bounty' was used as the initial capital to begin a school in Buremba village which is near Mbarara in the south western part of Uganda. Pastor Nnyanzi has been working in this area for many years amongst those whose background in Animism leaves them in great poverty as well as at huge risk of the modern day curse of HIV/AIDS. Witch doctors use unsterilised implements to cut each member of a family in a bit to appease the ancestral gods thus spreading infection to huge numbers of the community in a short period of time. Poverty also encourages prostitution on the trucker routes and in other areas of the community bringing the HIV/AIDS infection rates to incredibly high percentages, the result being that many children are left in the care of their grandparents whose life expectancy is also low as a result of the harsh conditions brought about by their poor lifestyle and environment. Henderson School makes great efforts to provide a quality education for the surrounding poor community, here some of the structures begin in a temporary fashion. Structures are rudimentary and resources limited but a beginning is made and progress achieved for those who have the opportunity to attend the school. 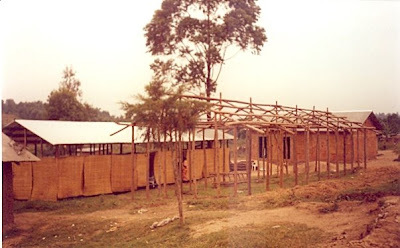 Wooden lap cladding and an earth floor make this classroom one of the least modern but the children who are being educated are benefiting and will go on to greater things if this school is able to remain active. Education to a child in Africa is a way out. A way out of the daily grind of the interminable chores around the house, carrying water for miles from the nearest water source, cleaning the yard, a trip to the store for grandma to pick up provisions and the back breaking work in the 'gardens' (small fields of crops to feed and support the family's income) digging and weeding with a heavy hoe. Education is also however, the hope of a brighter future. For generations families have lived in rural Africa with little or no hope of breaking out of the 'poverty trap'. They are consigned to the ranks of 'the poor' and for ever more shall be if change is not forcibly captured and tamed in their life today and for their future. The patience that is required to make an infinitesimal difference today in order that in the far off future the lives of others may benefit is indeed visionary. Children in Africa live a dream when they have education provided for them. A dream that was dreamt by their parents and grandparents before them, but also a dream that they dream themselves for their own future and their children and those who will come after them. Those dream makers who team up with the poor as they endeavour to harness change for me are catching hold of this future also. What will it matter in a 100 years if I have a new car this year , or if I get a holiday in the sun, or if my regular TV is replaced by a HD ready plasma set? Probably not a lot, but if I am to change the future for a child then in 100 years time a family, a community and a nation can be transformed. Children's bench seats double as desks when written work is required but never-the-less they persist with these simple means in order that their dream of breaking free from the poverty trap can become a reality. Mission International is committed to supporting this school and is working with individual donors to try to raise the funds to improve the facilities and resources in order that the educational provision at the school can further benefit the community and eventually the nation. By completing the bank mandate form you can be involved in supporting this school and in turn change the lives of needy children. 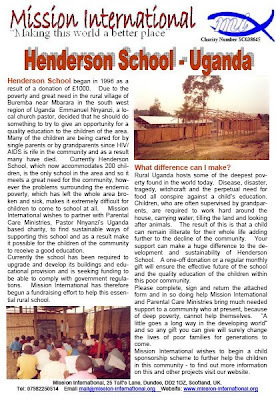 This blog is intended to keep you up to date with events relating to Henderson School in Mbarara Uganda, as they happen. Blogs always give the last entry first and so if you want to know more, page down and look for the option to view older blogs. Also, The 'Blog Archive' list below will take you directly to a particular post item. The links added to this blog will take you to other blogs related to the work of Mission International and to our website as well as give you the option to support our work. To contact us email on mail@mission-international.org - Enjoy! Married to Marie, with 4 children and two dogs. Was asked in 1989 to become 'an ambassador for the poor' and have been trying to do that ever since. Today the mission burns in my bones more strongly than it did at the start. There are times however, when I see the way that our world, me included, treats the poor, that I despair of the future both short and long term, if there is any long term left for this ailing planet. There are many programmes, projects and initiatives taking place around the world that are intended to bring relief to the poor however the boffins will tell us that Africa in particular is getting poorer and conditions are getting worse. The inevitable press attention when Sir Bob, Midge Ure and others made efforts to raise the profile of the plight of the poor and it makes no lasting difference we may have to ask the question how then we will see positive and lasting change brought about. The blisteringly rich dip their hands in their pockets and suggest that by some stoke of good fortune their efforts have changed things appreciably; frankly until the selfish heart is changed then no positive long-term change can happen.